:noobie:I got my 2016 two weeks ago with 29,100 miles on the ODO. The first time i started the car it might have said 16.8 miles per full charge. Of course there was not any plug-in power available and the car didn't even have a cord in it. Now, 300 miles later, it says 20 miles per full charge so it seems to like my current driving style. I am supposing that I should pick a screen to opt not to reset so that can serve as my "lifetime" totals. My Ford Mobile App. would give me all that perhaps? I am nervous about the clause in the agreement where we agree to unannounced software upgrades. My car doesn't have a data plan anyways, so how would any of the My Ford stuff even work? Can I be assured that my cell phone won't be used. I have next to no data in my cellular plan! 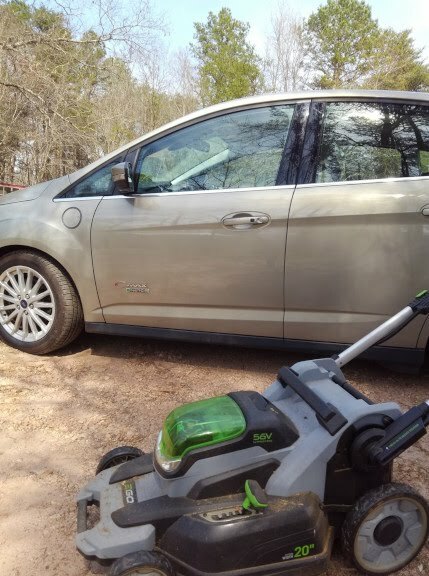 Yesterday I made 2 short outings in my car and then used my battery push mower to mow grass. Don't worry about the updates the car does have wifi capabilities and it's own 4G modem but they are long past spending any money on updates for our cars unless it is part of a recall. Great. Thanks Fred. So I have the App on my phone and I guess I should just go for it and complete the sign-up process. I have a new IA key on the way and will try to program it myself following the simple directions. :/ I am getting a rubber key fob sleeve as well. I'm going to have to take Ginny to the gas station already because of a couple of trips to Greenville and I only just finally started plugging in. I run the cord out of my cabin's window to her for now. It's kind of funny. I am having so much fun with her. Yesterday we had more photo ops. I parked beside a model X and took photos. I got shots of Ginny beside several makes of vehicles for direct comparison purposes. WHERE oh WHERE is my C-MAX? !!!! !